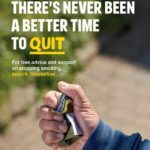 The Smokefree “Health Harms” campaign has run for six years in England, and is once again being released prior to the New Year to encourage smokers to take the opportunity to quit. A range of resources have been developed for the campaign based on best marketing practice, insight and testing with smokers [Click here for the main Health Harms Leaflet]. Focus this year is given to physical harm, highlighting the personal bodily danger every time someone smokes; the campaign features a new TV ad portraying the impact of poison from the tar in the cigarettes, initially affecting the bloodstream and then spreading across the entire body. What happens to your blood when you smoke? Quitting smoking is the best decision you can make for improving the health of your own body, and for those who passively smoke around you. Quitting smoking can be a long and hard process, but staying tobacco-free is the most important part of it. The National Centre for Smoke Cessation and Training (NCSCT) has a wealth of information on stopping smoking; watch a short video titled ’30 seconds to save a life’ to see simple interventions to change smoking behaviour. If you are thinking about going for a cigarette, reach for help instead; ask friends and family to support the new non-smoking you, or ask for outside support[Call: 200 07865 for the GHA Stop Smoking Service].